Mexican chocolate has a unique flavor with hints of cinnamon and spice and is a must try, if you haven’t done so. The coffee enhances the flavor of the chocolate and the gooey chocolate caramel sauce truly makes it decadent. If you don’t want to go the extent of making a layered cake cupcakes are an easy option. Abuelita brand is being used and comes in a box with 3.15 ounce discs, referred to as a tabilla. Mexican chocolate can be found in grocery stores in the baking or international aisle. If you would like to try other recipes containing Mexican chocolate try Mexican Hot Chocolate or Mexican Chocolate Fondue. Sift flour, dash of salt and baking soda into a large bowl and set aside. In a small pot over low heat melt butter, chocolate, coffee, brown sugar and vanilla. Stir continuously until well combined and melted. Remove form heat and let cool. In a medium sized mixing bowl beat egg whites with a mixer until stiff peaks are formed, set aside. In a large mixing bowl add yolks and coconut milk and mix until slightly fluffy. Add cooled chocolate mixture to the egg and coconut mixture and mix until combined. Next slowly add dry ingredients and mix until well combined. Gently fold in beaten egg whites until well combined. Spray three round 9 inch cake pans 1.5 inches in depth cake pans with the non-stick cooking spray with flour. Equally ladle batter into cake pans. Bake in a preheated oven at 375 for about 15 minutes or when a butter knife inserted comes out clean. Remove and allow cake to cool completely before assembling with filling and frosting. Make the frosting by placing the cream, butter, chocolate and brown sugar into a medium size pot over medium high heat. Stir aggressively and often until bubbles begin to form. Continue to stir while bubbles begin to fill the entire pot. Add coconut and continue to stir. Once mixture has become thick remove from heat. This process takes about 15 minutes so be patient, it is worth the wait. It will thicken a bit more as it cools. The frosting can be placed in the refrigerator to speed up the cooling process. If choosing to use pecans, chop and slightly toast in a medium size skillet over low heat until fragrant, about a minute. To assemble the cake place the first cake top side down onto a platter. If it does not sit steadily, shave a bit off the top to create a stable base. Add several tablespoons of the frosting and spread evenly over cake. Top with a layer of toasted pecans if using. Place the second cake onto the frosting. Again if the cake is oddly formed on top, remove to allow it to sit properly on top of the base cake. Add a several tablespoons of frosting and spread evenly over second cake. Top with pecans if using. Place the last cake on top flat (bottom) side down, so no need to create a stable base. 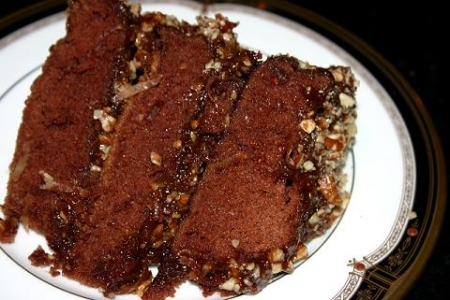 Frost entire cake and sprinkle with pecans (if using) on top and on the sides. To easily add the pecans cup your hand and lightly pat on the sides until the pecans stick to the frosting. Some of the frosting may drip off the cake and that is okay you can leave it or gently spread it back on the cake either way it will taste out of this world!